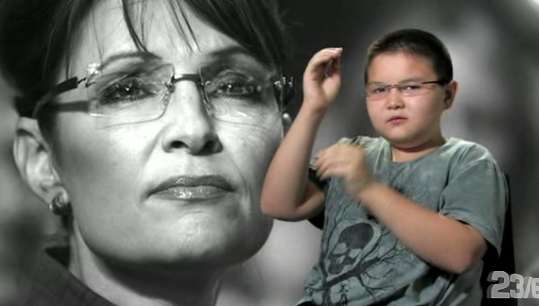 The Swift Kids for Truth, a group of weebies that can't form complete sentences without lisping adorably, take the piss out of Sarah Palin in a video called "Maverick." The description's about as infantile as the content: "The kids are in awe of that lady who looks like their Mommy when she's mad." Palin's status as "maverick," the munchkins argue with subtle irony, doesn't go much deeper than the frameless glasses on her nose. I'm no fan of the Palin gimmick, but here's a rule of thumb: if you've got a message to share, and the only way it sounds remotely intelligent or appropriate is if it's coming out of the mouths of kids, rethink it. There are few instances when using children as cause-oriented pawns actually works well. Most of the time, it's just repulsive. Is it just me, or does anyone else think Palins glasses are just for effect? Look at most folk wearing glasses and catch the line that the side of their face makes as it passes behind the lens. You'll see a sudden change in the line as the lens distorts the image. Palin's lenses don't make any difference as far as I can see. Could they really be plain lenses to make her look "intellectual"? Can anyone say John Kerry and botox? Or Nancy Pelosi and....well....BODY lift? Give me a break. Go take a purge. She doesn't need any gimmicks. She's one of the most real people in politics. I actually think she would look better without them.